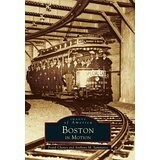 Boston in Motion, the sequel to Trolleys under the Hub, is an intriguing collection of photographs that captures the history of transportation in and around Boston. Authors Frank Cheney and Anthony M. Sammarco trace the stories from the earliest days of public transport with the Winnissimmet Ferry to the MBTA of today. A city known for its comprehensive public transportation, Boston has hosted every type of transit known to urban America. 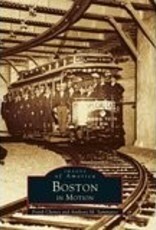 From the ferry, the horse railway, and the omnibus to the steam railroad and, eventually, the subway and bus systems, Boston has always been at the forefront of transportation advancements. The former "El" (the Boston Elevated Railway), the Old Colony Railroad, the Red Line, and the East Boston Line dramatically changed the face of Boston in the late nineteenth and early twentieth centuries. In Boston in Motion, these advancements are presented and explored in a riveting collection of original photographs.